Hair loss or alopecia can be caused by different diseases, damages and one or the other conditions of the body. Androgenic alopecia (male pattern baldness), Alopecia areata (local, total and universal) , Brock disease – Pseudopelada, Lichen Planopilaris, Frontal Fibrosis Alopecia – FFA, thyroid diseases, infectious diseases, intoxications, avitaminosis, protein deficiency, traumas, burns and surgical intervention of the scalp, radial therapy and chemotherapy, hormonal changes, incorrect hairstyle (tight ponytail, pigtails and braids), trixotilomania, stress – this isn’t a full list of hair loss reasons. But, the most common type of hair loss is – Androgenic alopecia. It’s more than 95 % of whole hair loss sufferers and nowadays up to 50% of men and more than 25 % of women suffer from varying degrees of this condition (see Androgenic alopecia and Hair Transplant). For example, after androgenic alopecia most common reason of hair loss is Alopecia areata, about 1,7 % of population is suffered of this kind of hair loss. That’s why if person has hair loss there is a big proficiency that it’s androgenic alopecia. In any types of hair loss patient can apply to our clinic and have a direct or online consultation. Many years of experience and professionalism of our doctors allows us to make a correct diagnosis during the first consultation and give appropriate recommendations. Sometimes for diagnosis we use a computer scanning of the scalp. The first consultation in our clinic is free of charges and anonymous. At Avanta Clinic we offer both: conservative (non-surgical) and surgical treatment of hair loss. All the modern technologies of conservative and surgical treatments of the hair loss proved in Armenia are accessible at Avanta Clinic. Hair loss or alopecia can be caused by different diseases, damages and one or the other conditions of the body. Androgenic alopecia (male pattern baldness), Alopecia areata (local, total and universal) , Brock disease – Pseudopelada, Lichen Planopilaris, Frontal Fibrosis Alopecia – FFA, thyroid diseases, infectious diseases, intoxications, avitaminosis, protein deficiency, traumas, burns and surgical intervention of the scalp, radial therapy and chemotherapy, hormonal changes, incorrect hairstyle (tight ponytail, pigtails and braids), trixotilomania, stress – this isn’t a full list of hair loss reasons. For example, after androgenic alopecia most common reason of hair loss is Alopecia areata. About 1,7 % of population is suffered of this kind of hair loss. Hair transplantation represents to be the only effective means of correcting consequences of androgenic Alopecia.It assumes transplanting hairs and follicles from one area of the head to another. Permanent, lifetime hairs are found in good supply in most people—even the severely bald—usually on the back of the head- nape area. This is called the “donor area.” Hair transplantation is permanent because the transplanted hairs are already resistant to the DHT hormone that causes hair loss, they will not thin or fall out in the future. In hair transplantation, DHT-resistant follicles are removed and implanted in thinning areas on the top and front of the head. Hair transplantation is effectively used in case of scar and traction alopecia’s as well, recently number of women who need in scar hair implantation after face lift surgery has also increased dramatically. For the hair loss sufferers with sufficient donor hair, surgical hair restoration is the most effective answer to their hair loss. Medical hair transplantation involves using hair grafts of natural hair follicles implanted very closely to each other in bald or thinning areas. 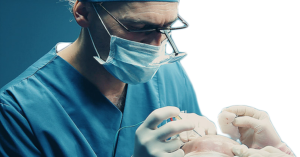 These grafts are prepared one by one under stereo microscopes by highly qualified surgical team and during hair transplant surgery hair grafts are implanted with small incisions into the recipient (bald) areas. When grown out, hair grafts produce natural results and it is impossible to detect the signs of any intervention. Recent years represent to be exciting time for the hair restoration surgery. Advances in equipment and technique now give us possibility to produce results impossible only a few years ago. The technique has gained international acceptance and the popularity of surgical hair restoration has grown remarkably ranking as the one of the top cosmetic procedure performed on men. Follicular Unit Transplantation (FUT) Method represents to be classical method for hair transplantation. It is more effectively used for harvesting big numbers of hair grafts from nape area in a single session. In case of FUT surgery donor hair is harvested in group of elliptical shaped strip and is dissected under stereo microscopes in follicular units one by one by highly qualified surgical team. Pre prepared hair grafts are implanted in hair thinning or bald areas in naturally occurring directions resulting in highly natural results. For the hairline, individual hairs are implanted avoiding a particular pattern but following the direction and angle of the natural growth of the hair, to form a totally realistic look. The result is hair that performs in the same way as the hair you used to have before. Only you and the people you choose to tell will ever know about the treatment. Above described hair transplantation method differs from other methods in donor hair harvesting technique leaving linear scar in nape area, which is only visible in case of shaving hair to zero level. The method of donor wound closure used in our clinic is based on Trichophytic wound closure technique eliminates chance of formation noticeable postoperative scars in the back of the head. The area from where the donor strip is harvested is hardly observable even for the private barbers. Follicular Unit Extraction Method represents to be comparably new technology of hair transplantation. It has been invented in order to extend limited donor area possibilities. It eliminate any chances of linear scar formation in nape area. FUE method is mostly preferred by the patients who appear to be concerned about scaring possibilities in nape area due to their comparably shorter hair style preferences. FUE method assumes harvesting hair follicles- grafts one by one from donor area using micro punches 0.7-0.8 mm in diameter. Method avoids need for skin cutting and suturing. While use of micro surgical instruments eliminate any chance of scar formation in donor area. Healthy hair follicles are obtained for further transplantation in hair thinning or baldness places. Even on totally shaved head under magnification it is impossible to detect any trace of the undergone surgical procedure. FUE technique makes it possible to harvest hair grafts from different parts of the body. Such parts are nape, beard, chest, legs, etc. in case of the not sufficient donor hair in nape area for correcting high scale baldness cases.